On Monday 4 September 2017, leading researchers and innovation developers will visit Falun for HTSC 2017. The conference aims to give a deep insight in the trends and innovation of future materials and steel research, sustainability, etc. The conference offers parallel sessions on steel, offshore renewal energy, AM/3-D printing and academy. There will also be a half day matchmaking event on Tuesday 5 September, the day after the conference. Chief scientists from the major steel industry companies, innovators and entrepreneurs with brilliant ideas, researchers and professors from colleges and universities will also make presentations, providing an interesting insight into potential strong development in the region. 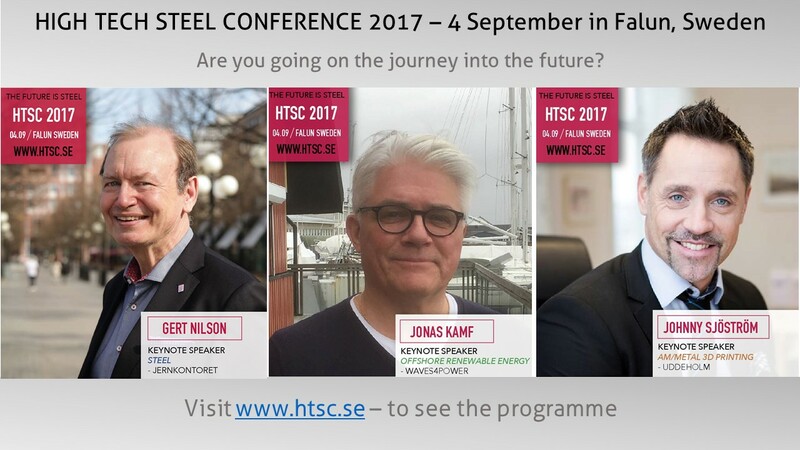 There is a very strong field of speakers where, among others, Gert Nilson, Technical Director of the Swedish Steel Association (Jernkontoret) will talk about "Steel - an exciting material for the future". Thereafter, a series of relevant profiles, each one expert in their respective fields of activity, such as Jonas Kamf, CMO Waves4Power who will talk about Adding Pure Power to the Industry, and Johnny Sjöström CEO of Uddeholm who will talk about 3D printing - The future of manufacturing ", mm. Fashion designer Naim Josefi talks about his innovation recipe and presents his designs made of steel. A group of young successful researchers from around the world who are gathered together for the international summer symposium NSCAS, The Nordic Summer Colloquium on Advanced Steel, will also participate in HTSC. They will make short presentations of their research areas and what they hope to get for results. Their participation has created a strong interest among companies and leading researchers. Larz Ignberg, Project Manager at Triple Steelix 2.0, who has a rigged the HTSC says: "There is a lot going on in our steel industry and many of our development and research projects show how far we are at the international level in our technology development. At the conference we will meet the elite of our innovators, from the larger and the smaller companies. For those who want to know the latest and are at the forefront of the R & D industry of the steel and engineering industry, the conference is a must. " Visit www.htsc.se for more information.